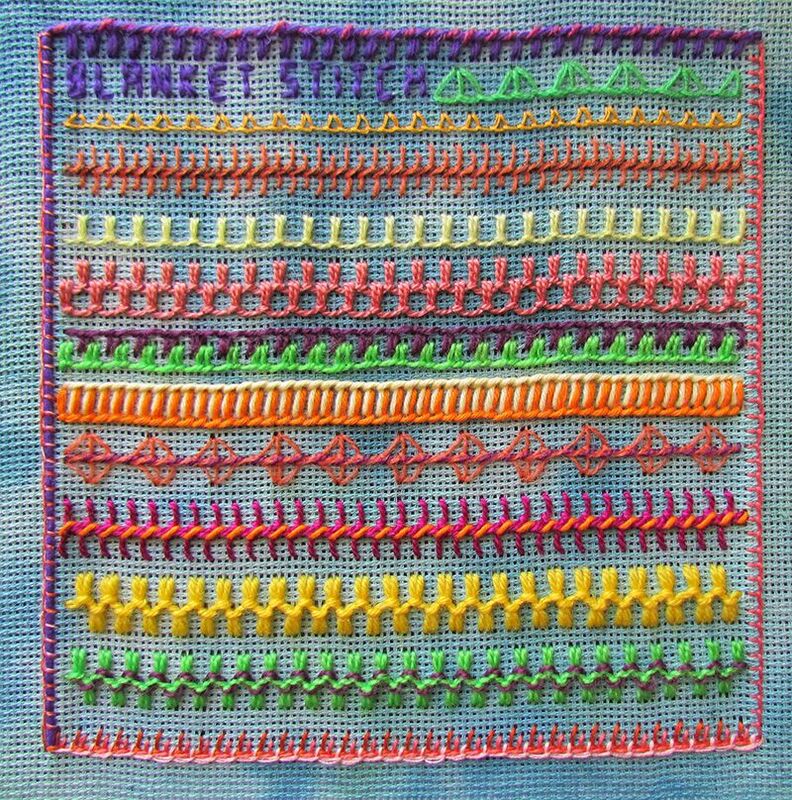 Feather Stitch Embroidery Sampler for TAST, Week 3. 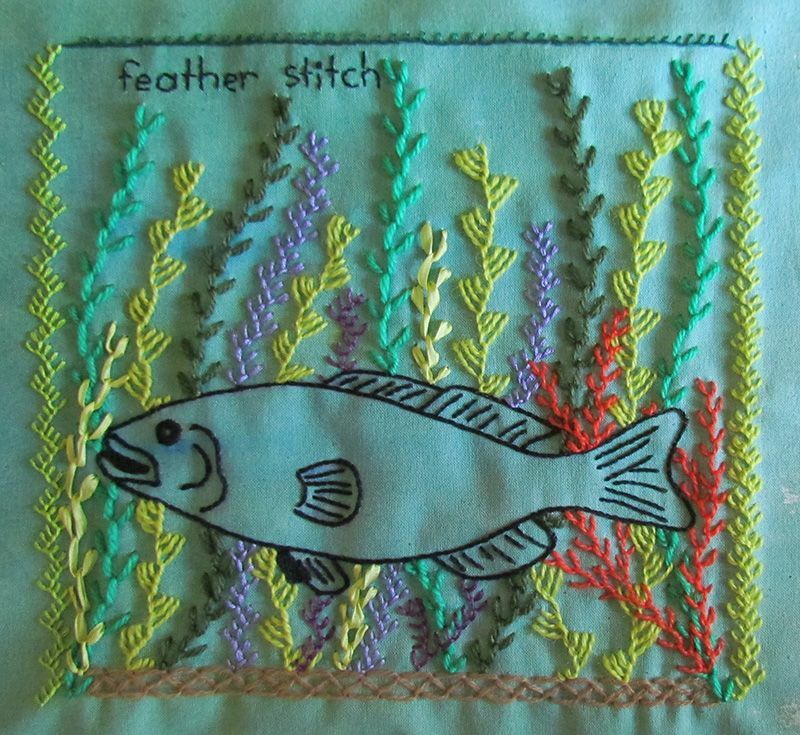 It was my intention to create a “negative space” fish in amongst the feather stitch seaweed and I don’t think it worked in that respect. I do like it though, which is why I stopped before the negative space experiment was successful. I learnt two important things about stitching the background rather than the subject. 1: In order for it to work, the background stitching needs to be really dense. More like this section on the top of the tail. It would probably work much better with a denser stitch like satin or stem stitch filling, although if I worked it with those the sample would be much smaller! Hmm, maybe I should add some beads to it. and 2: Filling in the missing bits of stitches you can’t complete in the “proper” way is really important to stop the stitching looking skimpy. I added a few straight stitches in the image below to visually finish a section of maidenhair stitch. I guess there’s a third thing I learnt too. I love working feather stitch. It’s very rhythmic and soothing. I decided to embroider one last little thing with buttonhole stitch before getting stuck into this week’s feather stitch sampler. Introducing the first of what will probably become a new obsession, an embroidered brooch. 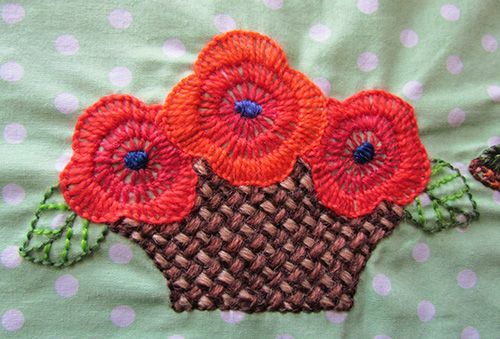 The flowers and leaves measure just 2 inches or 5cm across and are worked in buttonhole stitch, or close blanket stitch (whatever you prefer to call it) with two strands from 6 strand embroidery cottons in variegated orange and green. It has a plain unbleached calico back with some fleece batting in between, all held together with the satin stitch edging. 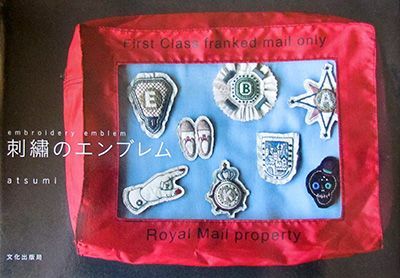 I sewed a brooch pin on the back but you could sew the finished patches to anything if you want them to be permanent. Whilst I used a vintage transfer for the flowers, the project was inspired by “Embroidery Emblem”, a Japanese embroidery book that I bought in Sydney a few years ago. I love the idea of creating little embroidered fragments and using them as objects in their own right. Maybe I’ll try a bracelet or two as well. 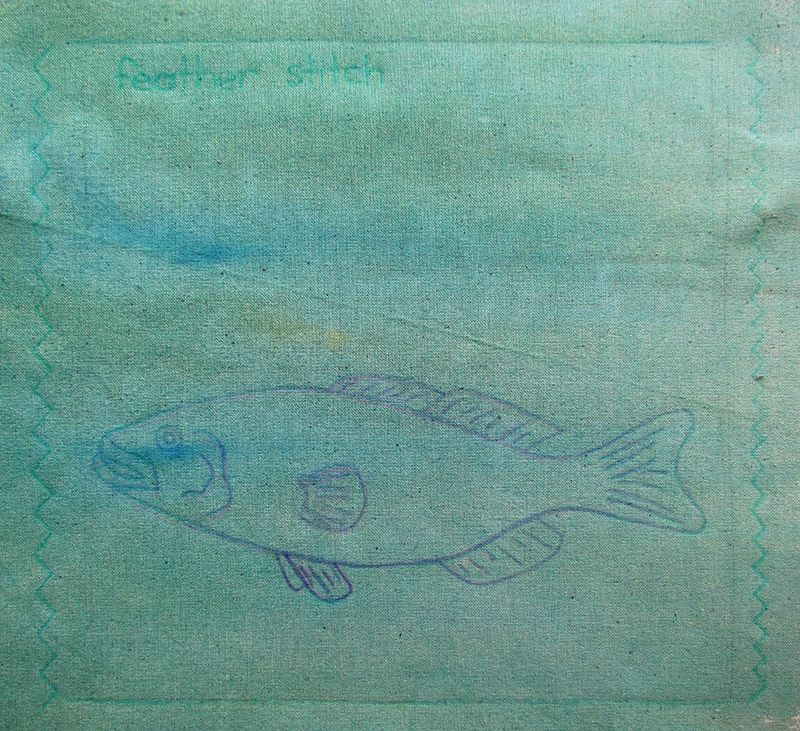 Now, on to this week’s TAST sampler which will be mostly feather stitch. 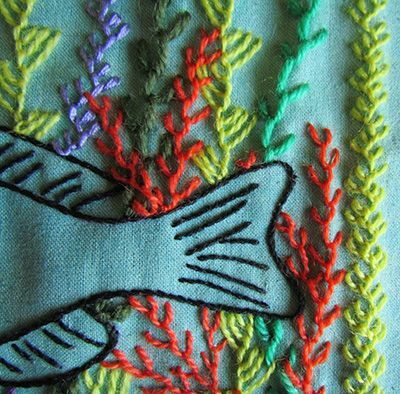 I thought I’d work the fish with a stem stitch outline and leave it as a sort of negative space fish amid the garden of feather stitch seaweed and coral. I’m going to try and obliterate that darn crease with a heck of a lot of stitching. And beads. Yeah, beads. I think I’ll start with the border. As you can see, I decided to make a second embroidered sampler for TAST week 2, blanket and buttonhole stitch. There were so many things I wanted to try that didn’t work on my other fabric and I had plenty of time so I thought, “Why not?”. First (thanks to Diane’s comment on my last post), I painted the background with a 50/50 mix of acrylic paint and textile medium, mixed with a lot of water. Then I traced my outer square, dividing lines and circles with a fine Clover water erasable marker like this one. I haven’t had any trouble with the blue coming back but I haven’t used it on linen yet, which is the fabric that seems to have this problem most often. To record some ideas I had seen online. I love working on a painted background. I thought I would hate crossed buttonhole stitch. It turns out I love it. My favourite threads for stitching large buttonhole circles are vintage Danish flower thread (partial green and gold circle on the top right), and DMC Medici (lime and purple arc at the bottom). 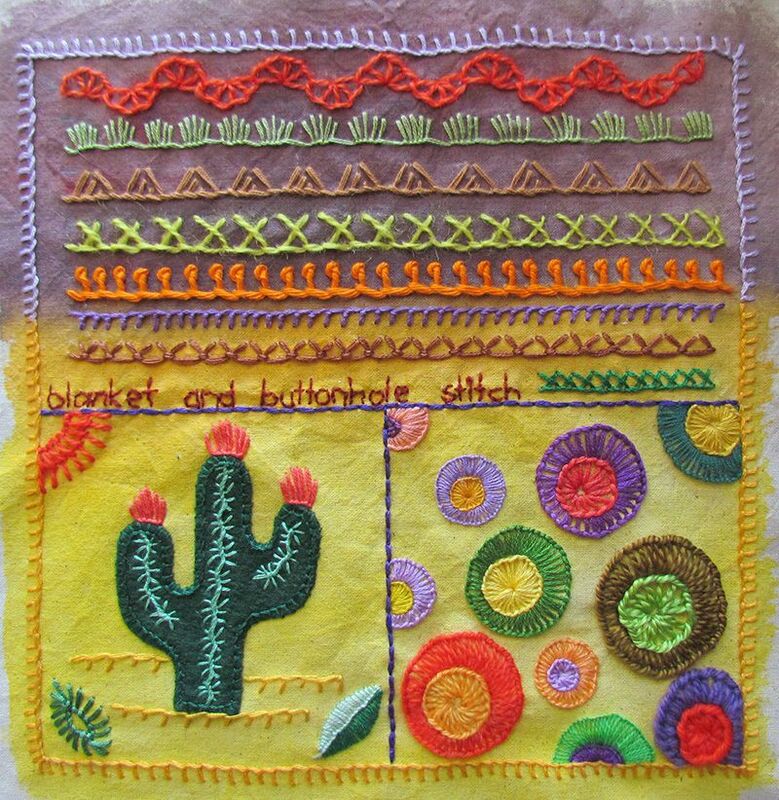 I want to stitch cacti on everything but I’m going to develop the idea using different stitches first. Buttonhole wheel on Pintangle (with a pic of the ric rac border on my first row). 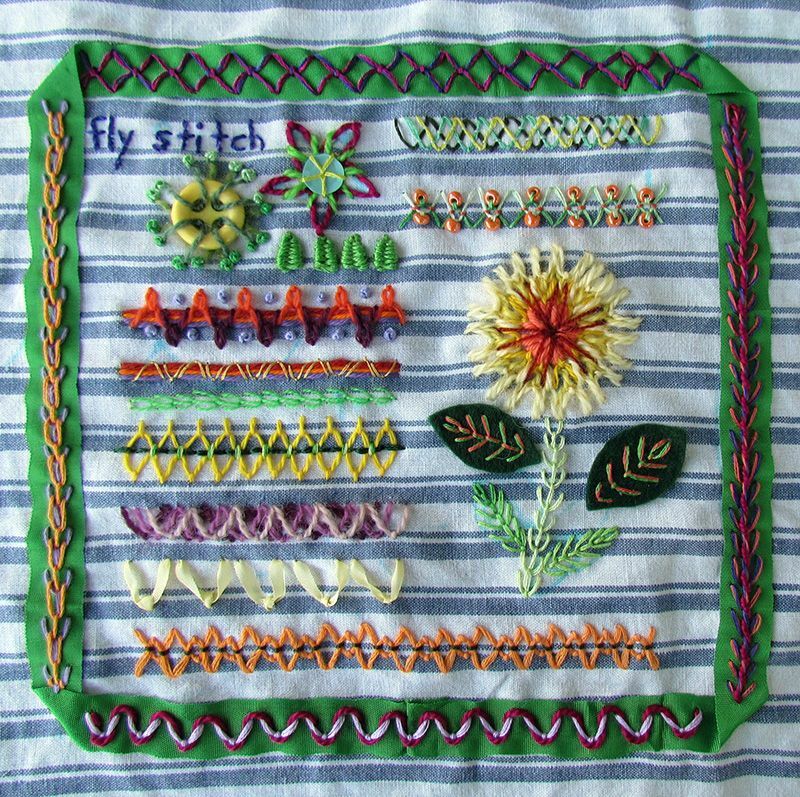 I’ve recently worked a couple of samplers using blanket stitch on vintage transfer designs, so I thought this week I would do something totally out character and stitch my sampler on a grid. Anyway, on to the pretties! My week 2 TAST sampler. I used just two very basic blanket stitches. 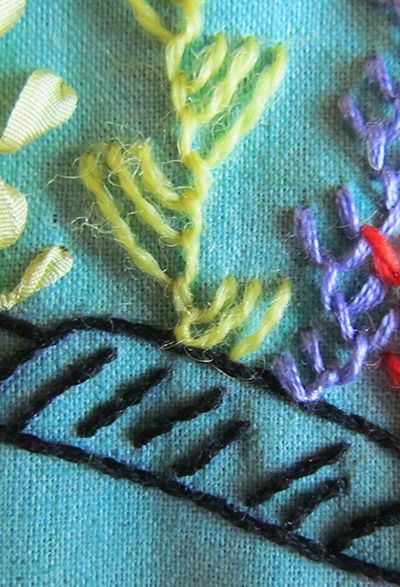 All of the rows of stitching are variations on basic blanket stitch and “up and down” buttonhole stitch that have been reversed, layered, whipped with other threads or with the vertical stitches going in different directions. I used crewel wools of all different thicknesses, from extremely thin to bulky crewel wools, ize 3 mercerised cotton (yummy shiny stuff), a little bit of stranded cotton and thick cotton a broder. Crewel wool (like tapestry wool only the strands can be separated) couched with 4 strands of embroidery cotton (2 strands each of two different colours). I love the finished sampler but I’m not sure I enjoyed stitching it as much as I usually do because I was confined to the grid. Since I haven’t played with all the variations I wanted to try, I might do another blanket/buttonhole stitch sampler with a more freeform setup like my first one. I was already working on some samplers before TAST started and used quite a bit of buttonhole stitch. These flowers are worked in buttonhole shading using Appleton crewel wools. You can print the design for free here on Knitting-and.com. My other sampler is worked in Dorset feather stitchery. Dorset feather stitchery uses a lot of blanket, feather and spiked chain stitches. Whipping the stitches with another colour totally transforms them. 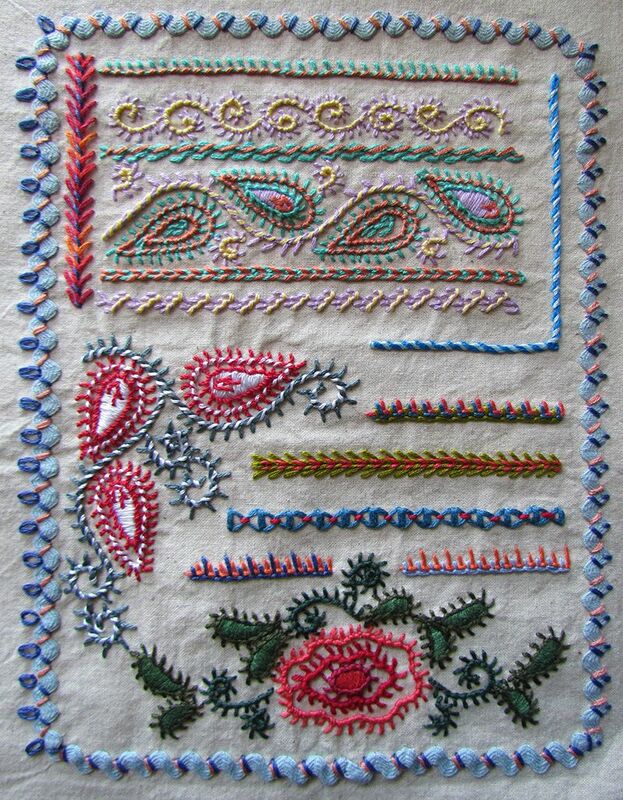 In this sampler all of the small curlicues and pinecones are worked in blanket stitch whipped with a second colour. The flower shown below is also whipped blanket stitch but it’s whipped with the same colour. I also tried a few variations on layered buttonhole borders. If you’d like to know more about Dorset feather stitchery find a copy of “Dorset Feather Stitchery” by Olivia Pass. You won’t have too much trouble as there are many, many copies available online for very reasonable prices. Now, should I have a go at a more freeform sampler or should I get a head start on next week’s stitch? Decisions, decisions! Sharon Boggon has been running the Take A Stitch Tuesday (aka TAST) challenge on and off since 2007 and I’ve been wanting to join in for just as long. Well it only took me 8 years. Here is my sampler for week 1, Fly Stitch. I’ve decided to work my samplers roughly 20cm or 8″ square and just stitch whatever takes my fancy on whatever fabric I feel like. It’s all very technical! I’m thinking of backing each one with plain fabric and using them to practice various edgings on. I really like the idea of a box of sampler doilies to browse whenever I’m looking for an idea. This week I concentrated on borders and layering, using lots of different textures stitched on a scrap of striped cotton. Week 2’s stitch is buttonhole. I haven’t decided whether to use some evenweave linen or a scrap of Japanese rayon(silk?) that was in the same scrap bag as the striped cotton.